I have a serious love affair with browned butter. It started in 2003 when I was experimenting with using hot and cold butter in my cookies, instead of the typical room temperature butter. I fell in love with the depth of flavor that it gave baked goods. Let us not forget about the caramel notes it gives cookies as well. Huge browned butter fan here! Who is with me? 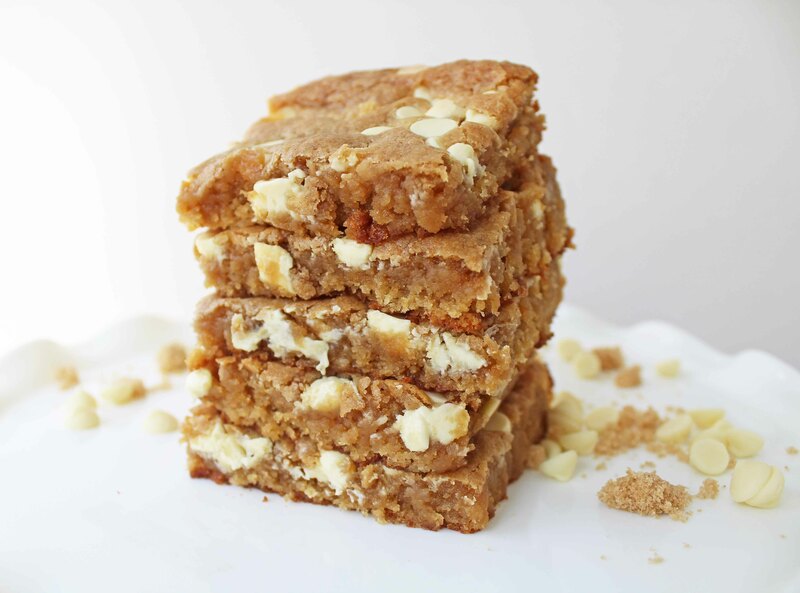 These Browned Butter White Chocolate Blondies are the bomb. I don’t even know why that is coming out of my mouth but they are that good. What is a blondie? It’s basically the first cousin to both brownies and chocolate chip cookies. That is the relative jackpot, if you ask me! 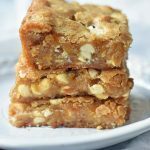 The beauty of White Chocolate Blondie Bars are they are similar to cookies but easier. We love easy! The dough is poured into a pan, baked and then cut into squares. 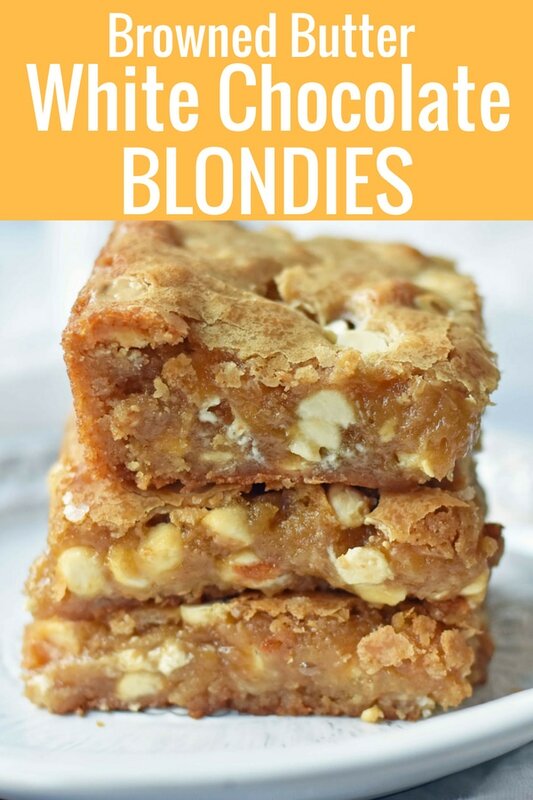 I played around with this Blondies recipe I found in America’s Test Kitchen Cookbook. It is the cookbook I reach for the most because of the amount of time they spend researching and experimenting with their recipes. I have mad respect for their methods! I would like to be like them, with their professional kitchens and paid dishwashers. I would LOVE someone to wash my dishes! Can you even imagine? Pure heaven. I digress. Brown the Butter. There is a technique to this method. You want to give the butter time to deepen but not so long that the water evaporates out of the butter. I found that constantly swirling the pan helps the butter to brown nicely. It is not something you want to walk away from. It’s serious business and needs to be watched closely. It will only take 3-4 minutes on medium heat. After you remove the butter from the heat, immediately add the brown sugar. You want it to be nice and hot so that when you add the brown sugar it dissolves nicely and becomes glossy. I usually stir it for 1-2 minutes to ensure that the sugar is dissolved. Chill it, baby. Don’t think you can skip this step! You will end up with scrambled eggs and melted white chocolate. No bueno. Let it chill in the fridge and while you are waiting, like your friend’s photos on Instagram. Tell them how amazing they are. People like that. When you know without a shadow of a doubt that your butter-sugar mixture is chilled enough, add those eggs and vanilla. 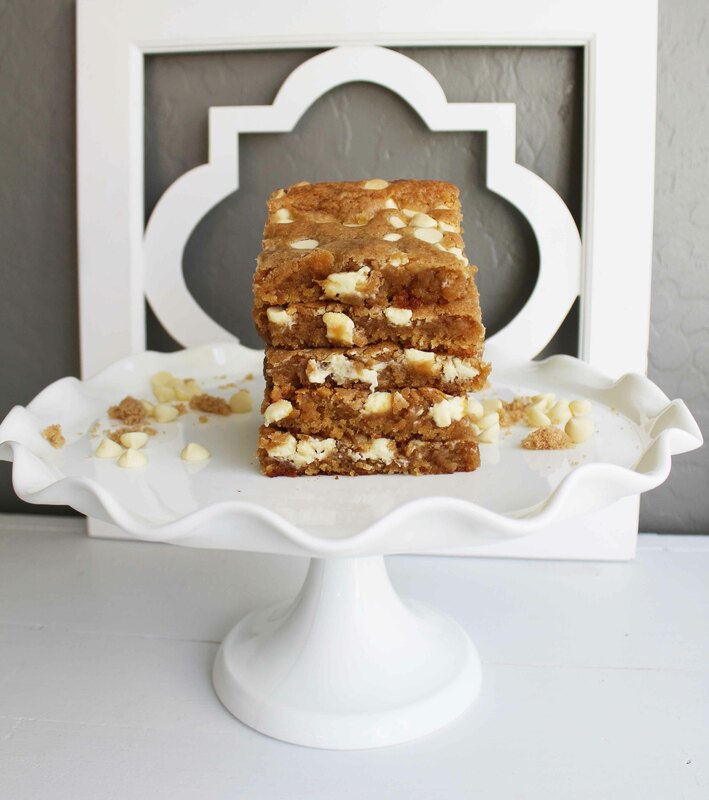 You can add white chocolate, pecans, chocolate chips, walnuts, M & M’s, or whatever your heart desires. Bake until edges are golden brown and a toothpick comes out clean. These tend to be slightly gooey in the center with crispy edges. You don’t want to overbake them so the edges are too hard. Let the blondies cool to room temperature before cutting. Place in the freezer if you are in a hurry. These blondies are so much easier to cut when they aren’t hot. Let them cool. 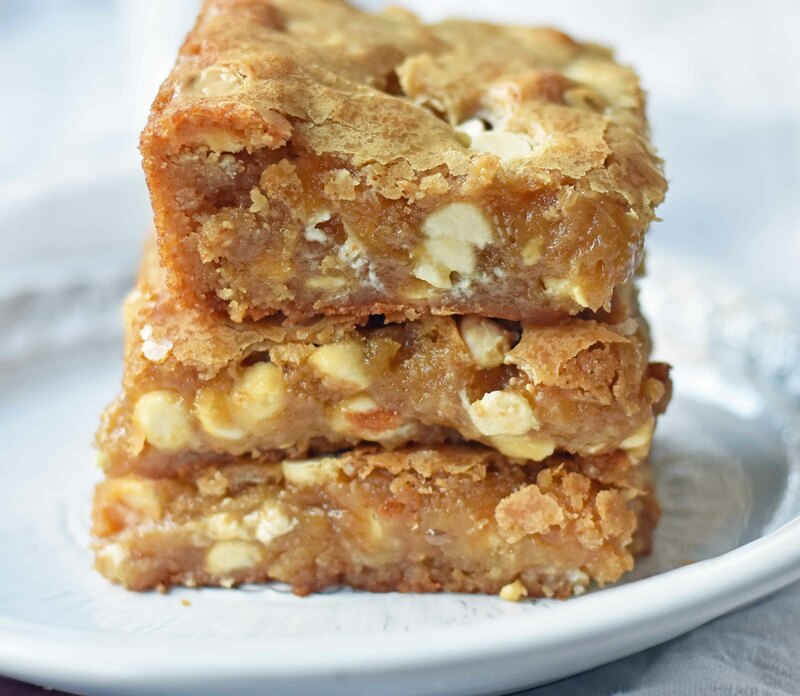 Browned Butter White Chocolate Blondies start with rich browned butter which adds a toffee and caramel flavor to these decadent bars. In a medium saucepan, melt butter over medium heat. As it starts to heat up, swirl the pan around often. Once it starts to bubble, let it deepen for 3-4 minutes. Remove from heat and add brown sugar. Stir it for 1-2 minutes until the mixture is nice and glossy and all of the brown sugar is dissolved into the butter. Let cool. It can be cooled at room temperature or can be put into the refrigerator for 10-15 minutes. It needs to be cooled to room temperature before adding the eggs. You don't want scrambled eggs! Before adding white chocolate chips, ensure the dough is chilled enough. You may want to put it in the refrigerator for a few minutes before adding white chocolate. Stir in white chocolate chips and optional pecans. Optional: Line a 8 x 8, 9 x 9, or 9 x 13 pan with foil or parchment paper. Pour batter into pan of choice, smoothing top with a spatula. Bake until top is shiny and slightly cracked approximately 20-24 minutes. 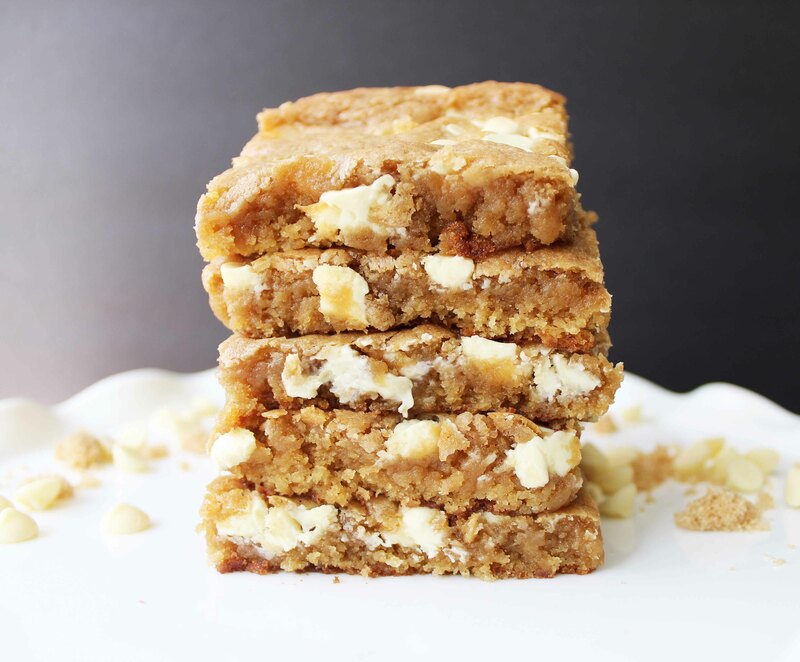 I am predicting that you will without a doubt LOVE these Browned Butter White Chocolate Blondies. Share the love with your friends and fam on Pinterest because people love themselves some baked goods. Hey, Melissa! Great recipe- if we use an 8×8, would you say baking time is closer to 24 mins whereas if we use a 9×13, baking time is closer to 20? What size dish did you use? I doubled this recipe and used 2 9 x 13 pans parchment paper lined. I substituted half of white chocolate chips with 2/3 cup of caramel chips and substituted unsweetened coconut flakes for half of the pecans. The only issue I had was cooking time. It took 30 minutes but no biggie.. just had to check it till it looked right. They were a delicious hit! Sweet and salty, moist and chewy. Thank you! These are amazing. I’d been looking for a recipe that works well with whole wheat flour and coconut sugar (I add ~ teaspoon of honey). I subbed 1:1 on both — so delicious! (A little more stirring to dissolve the coconut sugar.) These are going to be my go-to holiday cookie bar. Thank you so much! Should we use unsalted or salted butter?